Fully Feminine / Menstrual cycle Awareness for girls through monthly ritual. This article is written for a Redschool uk newsletter 2016. For quit a while, I was desiring for my daughter Leela, who is 7 years old now, to have a great relationship to her moontime and her cycle. She saw me impatient, grumpy and flat out exhausted, super sensitive so ‘don’t touch me too rough’ on the sofa every month. How was I to get her a more positive relationship to her cycle? How is she going to deeply enjoy being a woman and feel empowered in every aspect of her being? Of course, I needed to get a more positive relationship to my own moontime and cycle, as children will copy everything and anything they see before them. Here’s a little of my journey until the idea of a monthly ritual came to me. About a year ago, I found more information on the monthly cycle and started charting my cycle. Little later I learned much more about cycle awareness, read Lara Owen’s book Her Blood is gold and Alexandra Pope’s book The Wild Genie. I signed up for the Red School’s online Women’s quest and really got involved. I learned about the way my monthly cycle is divided in four stages. WHAT!!!!!?? Until then I lived with three ‘normal’ weeks of my month until I started my week of menstruation. Nobody ever told me…obviously because they didn’t know, and I was shocked to find such depths in my monthly cycle. It was like someone told me I had a hand that I had never been aware off, right in front of my face! Suddenly my menstrual week, including the tensed days before the bleed and a few after, became a source of vision, recuperation, delight, bliss and meditation by just being. I carried the desire to initiate Leela even deeper and about 5 month ago, during one of my bleeds I got a splendid idea! I was going to have a ritual with Leela, every month on my first day of bleeding, to celebrate and show her a very positive relationship to my bleed and winter time and her future ones. As ‘winter time’ is great for idea’s but not for execution, I decided to hold this idea and work it out in the next ‘autumn’ of my cycle. Here follows our ritual that is growing and evolving every time we do it. It takes about 5-10 minutes or longer if we have a nice tea time moment afterwards. 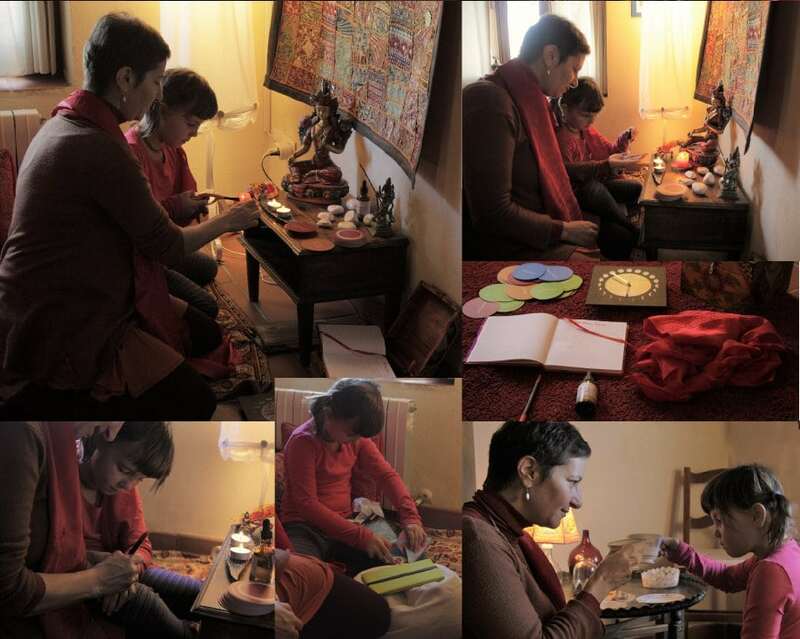 We sit in my ‘Goddess’ room front of an altar with a beautiful Green Tara with a red dress. Notebook in which the ritual is described. Bottle with mixed essential oils in a little carrier oil. We use rose, orange, lavender, neroli but you can choose your favorites. Then there is a gift for Leela; her favorite part of the ritual. We sit cozy close next to each other in front of the alter and we put the red scarf around us and Leela lights the candles. A candle for the Green Tara, one for her and one for me. Then I lead a gratitude prayer something like: Thank You for being a woman and a girl, Thank You that we can give birth to babies or anything else in our lives. We add whatever comes up. I thank her for being my daughter. Most times, she thanks me for being her mother. Then we put a few drops of oil in our hands and smell the delicious smells. and then… the long-waited moment and Leela’s favorite: the gift. If you’re on a budget, like I’m most months, I wrap something I would buy for her anyway. Like a new umbrella for winter, a DVD or next month she’ll get a new dress I bought some months ago, second hand and I know she’ll love it. I would have given the dress anyway, just now in gift wrap paper it becomes special. During our first ritual, she said she wanted to add drinking tea afterwards… in our finest china of course. So, that has become a sweet addition; we drink tea and chat about things and I take the opportunity to talk about cycles and moon times. Around my bleed, I’m still very sensitive, a few days out of function on the couch and easily irritated, so I love that we have such a sweet moment of intimacy and togetherness at the beginning of my moontime. I’m so delighted with our ritual and so is she. I was moving around some furniture in my ‘Goddess’ room this week and the first thing she said as she walked in was that I had to make sure that our ritual table needed to stay and have a good space. She’s asks regularly when our next ritual is going to be and she’s looking forward to her menarche (when a girl gets her first bleed) and is very happy to be a girl.